"What We're Reading" time again! Although technically Erin was the first to complete a full cycle of topics, this is my first time repeating a category I have already written in. I hope it is the first of many! Now, for the real topic. 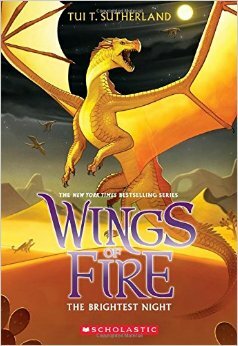 A few weeks ago, I wrote a post on great fantasy worlds, and used the Wings of Fire series as an example. In that post, I got to gush about my favorite part of reading fantasy: experiencing amazing new worlds. 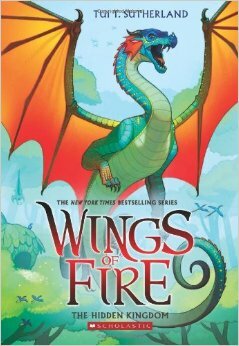 Here, I am going to go into greater detail on the Wings of Fire series, by Tui T. Sutherland. This series is a work in progress, and it can effectively be divided into two distinct parts. The first five books, or half of the series, is the part I am reviewing. These books are great for those who love action/adventure and in-depth fantasy worlds. There is virtually no romance, except for the occasional crush. It focuses more on the relationships between the main characters, who have grown up together and see each other as siblings. Find SeaWing egg of deepest blue. Wings of night shall come to you. will give to you the wings of sky. for an egg the color of dragon blood. the SandWing egg awaits unseen. she'll have the power of wings of fire. five dragons born to end the fight. Darkness will rise to bring the light. So begins the first book, The Dragonet Prophecy. 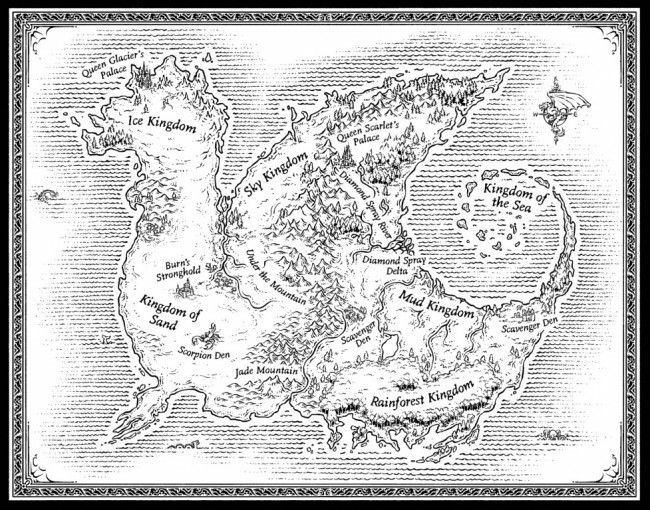 In the land of Pyrrhia, three Sand dragon (or SandWing) queens have been fighting for the throne for eighteen years. The other tribes have taken sides, and the world is torn apart by war. Everyone looks for the dragonets to come and end the destruction. Hidden away from the rest of the world, five dragonets - the Dragonets of Destiny, as they are known - anxiously await their chance to save the world. Unfortunately, there is a catch: the prophecy was broken almost as soon as it was spoken. The SkyWing dragonet was murdered before he was even born. Instead, one of the dragonets' handlers stole a RainWing egg to replace the missing SkyWing egg. The book begins eighteen years into the war when the dragon who spoke the prophesy, Morrowseer, comes to check on the dragonets. Infuriated by the absence of the SkyWing and the presence of a RainWing, Morrowseer declares that the RainWing, Glory, must be killed. Clay, the MudWing Dragonet of Destiny, and the self-proclaimed protector of the group, finally becomes fed up with hiding under a mountain at the mercy of their cruel guardians, waiting for destiny to come to him. He leads the other four dragonets out into the world... where they promptly encounter more danger than they ever expected. Over the next few books, the dragonets encounter the horror of the war firsthand and do all they can to end it. They get swept up into the political machinations of the warring queens, get kidnapped by their own tribes, and are both adored and hunted from one corner of Pyrrhia to the other. Ultimately, they fulfill the prophecy and bring the war to a close, but it comes at a high price. Each of the Dragonets of Destiny gets his or her own book. Every book is well written and distinct from the others, and I love how each character's viewpoint adds another facet to the story. Like everyone else, I had a few characters that I liked more than I liked others. So, when it came time to read the books that focused on the characters I didn't like as much, I groaned inside. I couldn't leave the series unfinished, though, so I decided to read them, even if I didn't like them. Of course, I thoroughly enjoyed the books focusing on characters I liked, but it was the books focusing on characters I didn't like that really caused me to have a lot of admiration for the writer. She managed to take characters I didn't like very much and create the perfect story to show off their strengths and weaknesses, who they are, and why I should care about them. I enjoyed those books just as much as I did the others. 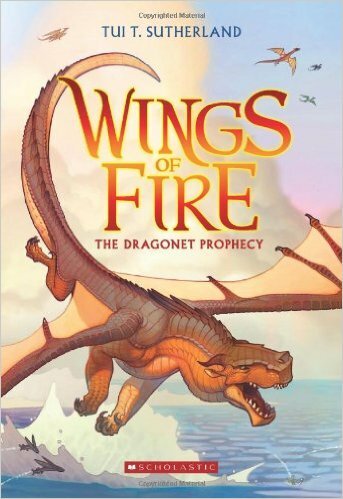 I don't want to repeat what I said in my other post, but for those of you who missed it, Wings of Fire is set in one of my absolute favorite fantasy worlds. It is populated entirely by dragons, and there are seven different types. The dragons of a same type live together in tribes, and each tribe is organically different. For example, SeaWings can see in the dark and have glow-in-the-dark scales. Why? Because it is dark underwater, and they have to be able to see. Also, it is impossible to speak underwater. They flash their glowing scales, much like Morse Code, to speak to each other in their own language. Each book explores a different region of Pyrrhia, and the depth and nuance of every area is magnificent. The main characters, the Dragonets of Destiny, are each so different and yet complimentary. Glory, the plan-oriented and dry-witted RainWing, clashes with Tsunami, the headstrong, impulsive SeaWing warrior. The NightWing Starflight loves books and scrolls, and remembers just about everything he reads. His knowledge is invaluable, but he often comes off as a know-it-all, and whenever danger hits, he freezes. Sunny is a perky, happy, naive SandWing that truly cares about others. Holding the group together is Clay, the strong, protective, and easy-going MudWing. The group dynamic is very organic and often humorous, but there is a lot of conflict when their personalities clash. These are considered tween books, but I have been reading them as a teenager, and I think they have the perfect balance of simplicity and complexity. Since many of the other books I read are thick and complex, and require a lot of investment to fully understand and enjoy, I love having these to relax with. They are fast reads, but the author doesn't sacrifice quality for simplicity. It's nice to be able to breeze through a well-written, engaging story once in a while, and these are perfect for that function. All in all, these are some of my favorite books and they are well worth reading. Do you ever find children's books to be interesting? Do you prefer lighter, faster reads, in-depth and complex stories, or do you like a good mix? If I were still in your area, I would lend them to you. :( They are fantastic books though. Thanks for reading! I wish you were! Maybe we can discuss them via email. You're welcome! Fun! I'll recommend them to all the dragon-lovers in my family! Great post, Hannah! You definitely have me intrigued by some of the details you included, such as the fact that the prophecy didn't turn out as planned and the various personalities of the dragonets. Like you, I enjoy well-written books for a younger audience, especially when I need a break from heavy reading. I love children's books! Some children's books I really love, but others I don't like because they are too stereotypical, or any number of reasons. I like a good mix of fast reads and in-depth stories. I have seen this series at the bookstore many times, but have been unsure I would like it... I shall have to keep it in mind!